Here at Call for Participants we love new tech and bringing it to the academic community. It gives us great pleasure to announce that we have a small update to our Twitter promotion tool that we are sure you will love. 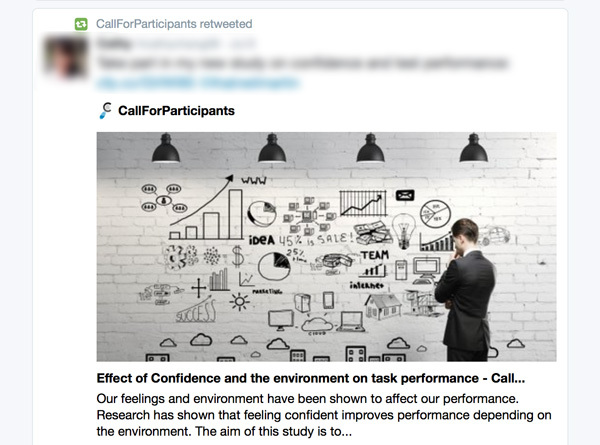 Now when you use the Twitter promotion tool on your study promotion page (here's how to do it), you will get the analytics on your study page just as before, but the tweet gets enriched with your study's cover image, and details, giving potential participants an easy way to learn more about your study without ever leaving the Twitter environment.